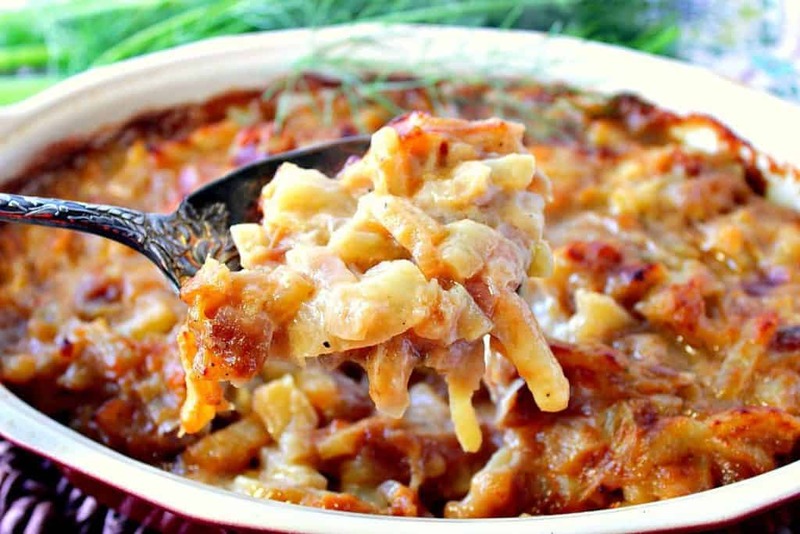 Fennel Onion Gratin is a deliciously cheesy side dish that is wonderfully flavorful and simple to make. It’s the perfect accompaniment to any main course, or it can become the main course all on its own. 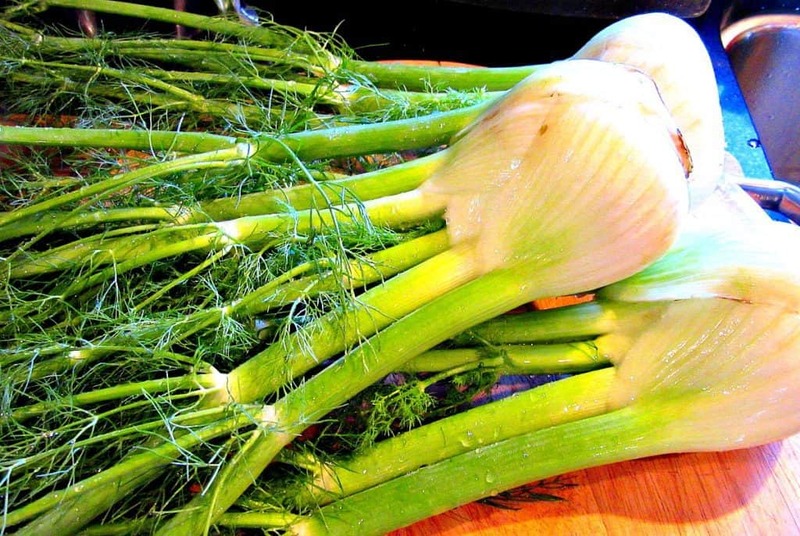 If you’re not familiar with using whole bulb fennel as an ingredient, when cooked, it has the very mild and sweet flavor of anise or licorice. Now don’t be scared away if you’re not a licorice fan, because I’m not either! That said, cooked fennel won’t hit you over the head like black licorice candy can. It’s flavor dances subtilty in the background and quietly yet unobtrusively becomes the star of the show. 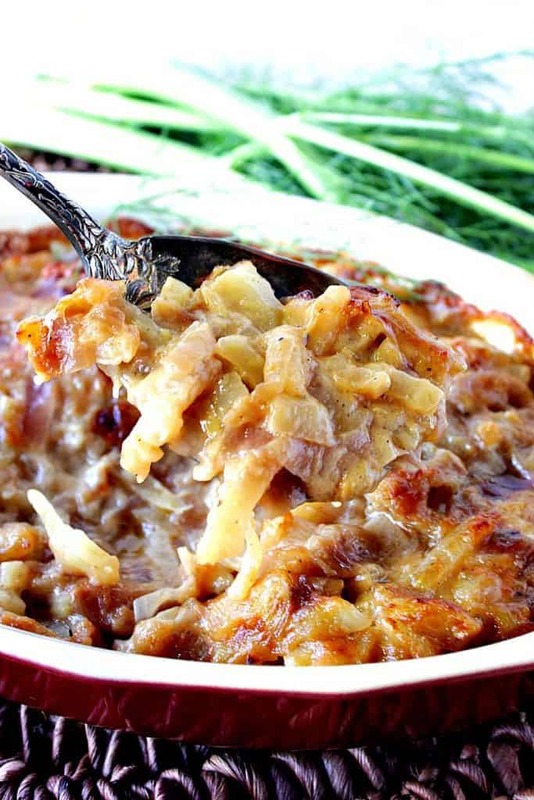 Enter, stage left, Fennel Onion Gratin, to take your much-deserved bow! When I’m eating cooked fennel, I’m instantly reminded that it’s one of my very favorite flavors, which why I need to cook with it more often. For me, its depth of flavor is like no other vegetable I know. In addition to fresh fennel’s flavor being superb, another thing I adore about it is that I believe it is one of the most stunning vegetables in the produce department. I mean, how can you argue with those wispy, airy verdant green fennel fronds that adorn that firm and delicious bulb? There’s no way to deny it. Fennel has it ALL going on! To make my Deliciously Cheesy Baked Fennel Onion Gratin you’ll need the following ingredients. Three fennel blubs, one medium onion (I used a red onion), olive oil, butter, salt, pepper, vegetable stock (or chicken stock if you’re not eating vegetarian), mayonnaise, shredded mozzarella cheese, and shredded romano cheese. Trim the top fronds and the root base from the fennel bulb. Divide each bulb into quarters and cut each quarter into ¼” slices. Slice a medium red onion into ¼” slices. Add olive oil and butter to a large skillet over medium-high heat. Add the sliced fennel and onion to the skillet along with salt and pepper. Stir occasionally until the fennel and onions are softened slightly (approximately 3-4 minutes). …along with the shredded mozzarella and Romano cheeses. Turn off the heat and stir until the cheese has melted. Spoon the fennel-onion mixture into a small casserole dish (or gratin dish) that has been sprayed with olive oil or cooking spray. Bake in a preheated 425-degree oven for 30-35 minutes or until the gratin is golden brown and bubbly. When purchasing fennel bulbs, choose ones that are smooth with an even creamy color and that are firm and compact in size. Not all markets sell them with the pretty green fronds so if you can’t find them sold that way, no need to be concerned. 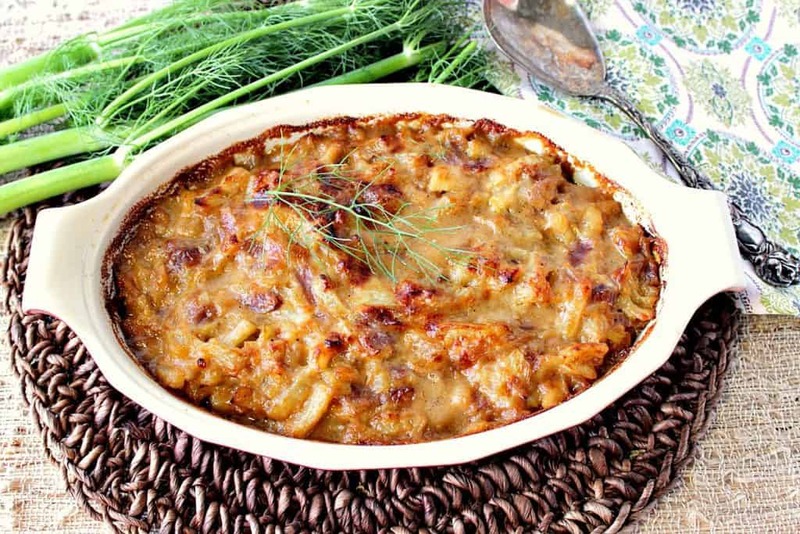 For this particular recipe of Fennel Onion Gratin, the fronds aren’t used, except as a little garnish. However, should you choose to save the fronds and not dispose of them, you can add them to a homemade soup stock for an extra layer of flavor. Another thing I suggest doing with a few slices of raw fennel (and a touch of the frond), is to add them to your favorite salad. Fennel, raw or cooked, is terrific for your digestion and will help with gas, bloating and/or indigestion. See there? Additional reasons to use fennel more often! 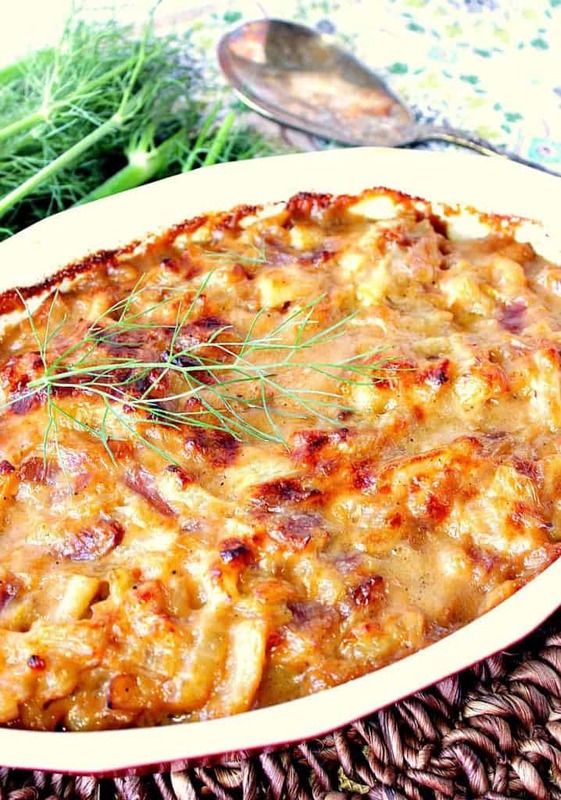 Fennel Onion Gratin is a deliciously cheesy side dish that is wonderfully flavorful and simple to make. It's the perfect accompaniment to any main course, or it can become the main course all on its own. Melt the oil and butter in a large skillet over medium heat. Add the fennel and onion to the skillet and stir well. Add the salt and pepper to the skillet and cook the fennel and onion, stirring occasionally, for approximately 4-5 minutes. Add the broth to the pan, scraping up any browned bits from the bottom of the pan. Continue cooking over medium heat for an additional 2-3 minutes. Turn off the heat and stir the mayonnaise, mozzarella and Romano cheese to the fennel mixture and stir well to combine. Spray a small 1½ quart casserole dish or gratin dish with olive oil or cooking spray. Spoon the fennel and onion mixture evenly into the dish. 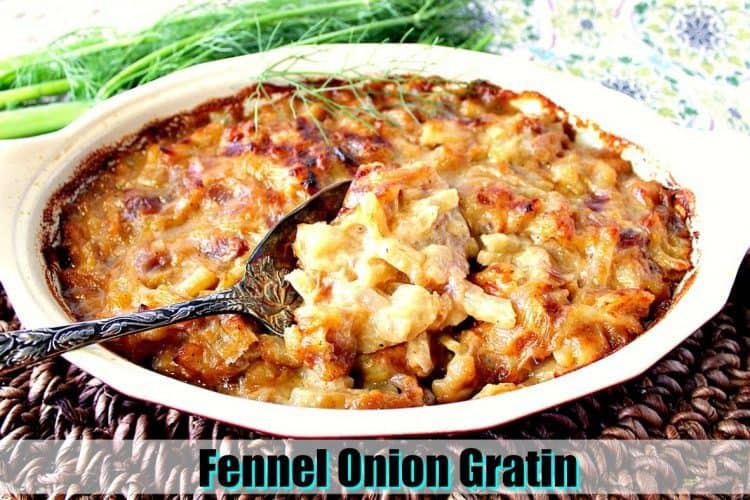 Bake the fennel-onion gratin in a preheated oven for 30-35 minutes, or until the gratin is golden and bubbly. I also love recipes which utilize the seed of the fennel plant. Below you’ll find a few recipes I’ve shared over the years that either call for the fennel bulb or fennel seeds. Enjoy! I hope you’ve enjoyed this recipe for Fennel Onion Gratin as much as I’ve enjoyed bringing it to you. Should you have any questions regarding this, or anything else you see on my site, please don’t hesitate to contact me directly, or leave me a comment in the comment section below. It is always my distinct pleasure to get back to you with a reply just as soon as I possibly can!